NASA's Terra satellite and a NASA animation of imagery from NOAA's GOES-West satellite provided views of Hurricane Newton as it neared landfall in Baja California, Mexico, today, Sept. 6. NASA's Terra satellite captured a visible image of Newton on Sept. 5, Monday, at 1:45 p.m. EDT (17:45 UTC) just as it was classified as a hurricane. 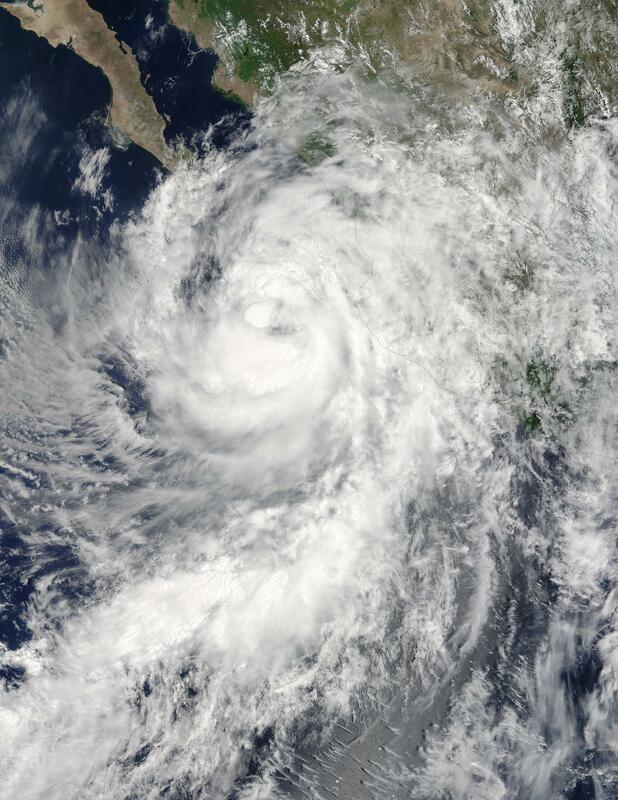 At the time Terra saw the storm it was south of the southern tip of Baja California, Mexico. On Sept. 6 a Hurricane Warning is in effect from Cabo San Lazaro to Mulege, including Cabo San Lucas, and from Guaymas to Bahia Kino, Mexico. A Tropical Storm Warning is in effect from north of Cabo San Lazaro to Punta Abreojos and from north of Mulege to Bahia San Juan Bautista, Mazatlan to Guaymas and Bahia Kino to Puerto Libertad. In addition, a Hurricane Watch is in effect for Bahia Kino to Puerto Libertad. An animation of satellite imagery showing the intensification and progression of Newton over two days was created by the NASA/NOAA GOES Project at NASA's Goddard Space Flight Center in Greenbelt, Maryland. The animation of infrared and visible images from NOAA's GOES-West satellite shows the development and movement of Hurricane Newton from Sept. 4 through Sept. 6 at 10 a.m. EDT (1400 UTC) toward Baja California, Mexico. At the end of the animation, Newton was located about 110 miles (180 km) northwest of Cabo San Lucas, and about 50 miles (80 km) west of La Paz, Mexico. Newton was battering Baja California Sur with strong winds and heavy rains. On Tuesday, Sept. 6 at 11 a.m. EDT (1500 UTC), the center of Hurricane Newton was located near 24.1 north latitude and 111.1 west longitude. That's about 110 miles (180 km) northwest of Cabo San Lucas and 50 miles (80 km) west of La Paz, Mexico. Newton's heavy rainfall is expected to stretch over a long distance from Baja California, Mexico into the U.S. Southwest. The NHC said that Newton is expected to produce total rain accumulations of 8 to 12 inches over the Mexican state of Baja California Sur, and 5 to 10 inches over the Mexican states of Sinaloa, Sonora, western Nayarit, and Jalisco, and a small part of Baja California Norte through Wednesday. Isolated maximum amounts of 18 inches are possible in Baja California Sur. For updated forecasts, warnings and watches, visit the NHC website: http://www.nhc.noaa.gov. Moisture associated with Newton is expected to produce total rain accumulations of 1 to 3 inches with locally higher amounts over southeastern Arizona and southwestern New Mexico through Thursday, Sept. 8. In all of these locations, heavy rain could cause life-threatening flash floods and mud slides, especially in mountainous terrain. For local forecasts in Arizona and New Mexico, visit. http://www.weather.gov. Gradual weakening is expected during the next 24 hours, and rapid weakening should occur once Newton moves well inland over northwestern Mexico on Wednesday, Sept. 7. Tropical Storm Newton could bring 'life-threatening' conditions to Ariz., N.M.